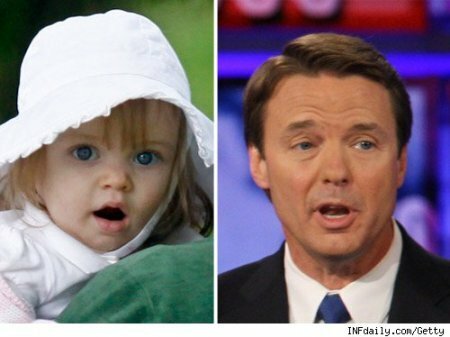 John Edwards Is Rielle Hunter’s Baby Daddy. File this one under DUH! John Edwards has finally admitted he fathered a baby with his mistress Rielle Hunter. Back in 2007 The National Enquirer reported that the former Senator from North California had an affair with Rielle Hunter, a woman traveling with his campaign. Of course at the time John Edwards and his team did everything they could to deny and deflect, but the fire of scandal was lit and there was no turning back. Meanwhile, John’s wife Elizabeth Edwards was battling cancer and publicly supporting her husband. I can only imagine what was going on behind closed doors. In the two years since, sources have come out to confirm the rumors of the affair between Edwards and Hunter, including that John Edwards in Quinn Hunter’s biological father. But there was never an official admission and some people were still skeptical. Around the time pictures of the baby looking a whole heck of a lot like John started to come out, Elizabeth Edwards went on Oprah and said she didn’t think her husband of 30 plus years was the father of Rielle Hunter’s baby; except Elizabeth never actually said Hunter’s name if memory serves. John Edwards may finally have copped to being Quinn Hunter’s father, but he’s still a snake. And quite frankly it makes me a bit nauseous knowing Elizabeth Edwards is still married to him. “I am Quinn’s father. I will do everything in my power to provide her with the love and support she deserves. I have been able to spend time with her during the past year and trust that future efforts to show her the love and affection she deserves can be done privately and in peace. It was wrong for me ever to deny she was my daughter and hopefully one day, when she understands, she will forgive me. I have been providing financial support for Quinn and have reached an agreement with her mother to continue providing support in the future. 50 queries in 0.615 seconds.